As one set of samples hits the news stands another set gets made so we've been busy finishing off the samples for Future Music issue 217. And this months theme is a good 'ol dollop of drum machine abuse. We took a few of our vintage machines and threw them through a chain of hardware effects and stompboxes. 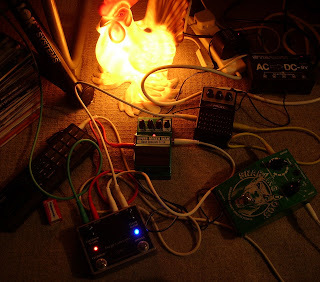 Some of the chains were quite complex -below is a pic of a Boss DR220a (bit rubbish 80's machine) being put through a Snarling Dogs overdrive, into a cheap and cheerful delay (forced into self feedback, more on that later), into a bass synth wah. The output of the synth wah is then fed through a feedback looper pedal that feeds its output back into it's input for some sonic madness. Oh and the chicken lamp is optional (although every studio should have one). Other chains included a Korg Rhythm 55 into a radioshack reverb into the Moogerfooger low pass filter. The Envelope out votage was taken from the filter and patched into the gate-in of the Moog little phatty. The output of the little Phatty was then thrown through a Moogerfooger phaser and mixed with the Korg/lowpass signal at the mixer - phew! Basically this results in the drum machine rhythmically gating the Moog as well as its output being filtered by the Moogerfooger. You can check out some examples of the results of all this stomp chaining (and some more free samples to download and abuse) at our soundcloud page here.